Fitch Ratings has affirmed the Ukrainian City of Kyiv's Long-Term Foreign- and Local-Currency Issuer Default Ratings (IDRs) at 'B-', Fitch Ratings said in a press release on September 21. Simultaneously Fitch has upgraded Kyiv's National Long-Term Rating to 'A(ukr)' from 'A-(ukr)'. The Outlooks are Stable. 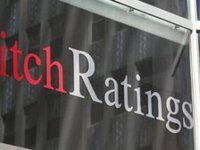 Fitch said that the upgrade of the National Rating reflects the improvement in Kyiv's credit strength following the exchange of $101.15 million of the non-restructured part of $250 million LPN due in 2015 for new LPN due in 2022. Fitch has also assigned PBR Kyiv Finance PLC's $115.072 million loan participation notes (LPN) due December 2022 a 'B-' rating. "The issuer is the city's financial SPV, and the LPN were issued on a limited recourse basis for the sole purpose of financing a loan made to the city. Thus they represent direct, unconditional, unsecured and unsubordinated obligations of Kyiv and at all times rank pari passu with all its unsecured and unsubordinated obligations," Fitch said. As was reported, Kyiv's 2015 eurobonds were included in the perimeter of the debt operation envisaged by the International Monetary Fund's Extended Fund Facility (EFF). They included two issues of eurobonds: 10-year $250-million eurobonds maturing on November 6, 2015, with a coupon rate of 8% per annum and five-year $300-million eurobonds maturing on July 11, 2016, with a coupon rate of 9.375% per annum. On November 23, 2015, Kyiv offered bondholders to exchange its eurobonds for sovereign eurobonds of Ukraine falling due in 2019-2020 and state derivative securities. In keeping with the offer, one bond with a nominal value of $1,000 was to be swapped for two sovereign eurobonds maturing in 2019 and 2020 whose face value is $375 each and a rate of 7.75% per annum and state derivatives with a conditional value of $250. Interest accrued on the bonds was to be capitalized and added to the principal amount of new bonds. As part of a debt restructuring operation, the government of Ukraine on December 18, 2015, allowed the conversion of Kyiv's debt on 2015 eurobonds worth $117.394 million and 2016 eurobonds worth $233.672 million into state debt. The restructuring of the 2015 eurobonds was backed by 59.51% of their holders and that of 2016 eurobonds - by 90.9%. According to a source of Bloomberg, the 2015 eurobond offer was rejected by London-based Franklin Templeton Inv Mgmt Ltd., which held 32% of 2015 eurobonds. After that, according to available information, negotiations were held with that creditor. Kyiv City Council on September 4, 2018 completed the restructuring of its outstanding foreign debt by exchanging eurobonds with a yield of 8% and maturing in 2015 with a total nominal value of $101.149 million for new loan participation notes (LPN) falling due on December 15, 2022, with a yield of 7.5%.